Although it was announced that the VEP would cost RM25, apparently the money was not collected as in December 2018. You should not confuse VEP with the Road Charge (RC) for foreign vehicles. RC (currently RM20) is charged for foreign vehicles when it enters Malaysia (through Johor only currently). Each time your car enters Malaysia, you need to pay it. As a comparison, VEP is a permit with a 5-year validity period and costs RM25. Is it compulsory to get a Malaysia Vehicle Entry Permit (VEP) to drive to Malaysia? Legally, yes, it is compulsory to get the Malaysia VEP if you drive a Singapore-registered car to Malaysia. But, it is NOT implemented yet as up to January 2019. So, most cars crossing the Singapore-Malaysia border in January 2019 do not have a valid VEP yet. The tricky thing is you do not know when it will be implemented. So, you should register VEP now if you haven’t done it! 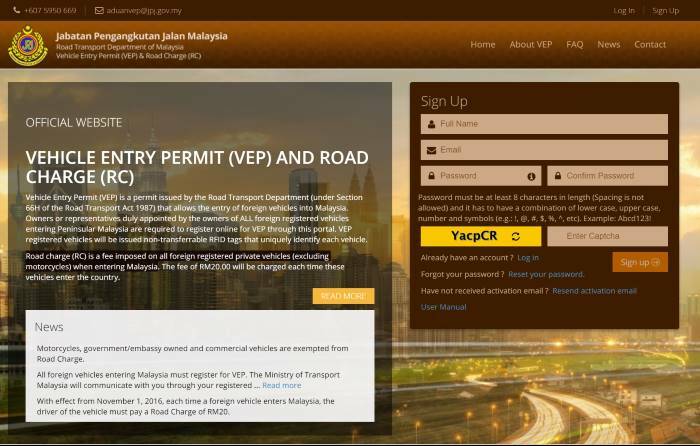 How to register Malaysia Vehicle Entry Permit (VEP)? You can only register the VEP online using the VEP portal (https://vep.jpj.gov.my/#/). You need to create/register an account on the portal. As I know, there are no other ways to register VEP. Anyway, It is very easy. It just takes a few mins to register the vehicle entry permit. There is even a very detailed guide for the whole process. Your personal info. There are no special requirements. You just fill in the basic personal info. Your vehicle info. Although you can fill the form manually, you can save a lot of time by simply uploading the PDF file of your car registration. The system will extract the info and fill the form for you automatically. Please note, you MUST use the PDF file downloaded from OneMotoring/LTA (https://www.onemotoring.com.sg/). If you scan the hardcopy of your car registration sheet as a PDF file, the system will not recognize it. After you submit the registration, you can then download a copy of the registration confirmation slip (as illustrated below), which will also be sent to your email. If you find anything is not correct, you can amend/update it at any time in the portal. You will need to use the VEP portal for any updates, booking the appointment for VEP RFID tag collection, and renewing VEP. So, keep the account info in a safe and accessible location. What to do after registering Malaysia Vehicle Entry Permit (VEP)? You do not need to do anything for now until you hear from us again. We will soon announce the date and location where you can collect your VEP RFID Tag via VEP website as well as other channels. During tag collection, please print and bring along the Confirmation Slip together with other supporting documents. You may find out about the supporting documents from the FAQ section located at VEP website homepage. If you have any questions about this matter, please contact +607 5950 669 or email to aduanvep@jpj.gov.my. Basically, you have to wait (to collect the RFID tag). Some owners only waited for 2 to 3 weeks and were notified to collect the VEP tag. Some have waited a few months. So, nobody knows how long you have to wait. Here are some tricks that may help you get the notification earlier. Make sure all info is correct. Every one or two months, you may try to “update” your registration in the VEP portal. Write a polite email to inquiry on the status. Anyway, you should not worry about VEP once you finish the registration and get the confirmation slip. Some owners also set up Touch ‘n Go eWallet when waiting. What is the correct ID type to link VEP tag to Touch ‘n Go eWallet? Your VEP tag will be linked to a Touch ‘n Go eWallet when you collect the VEP tag. If you are a Singaporean (holding a Singapore passport), you should choose NRIC as ID type in the Touch ‘n Go eWallet. If you are not a Singaporean (holding a passport from countries other than Singapore), you should choose the passport as ID type in the eWallet. If you choose the wrong ID type, then you cannot link them. You need to create a new account for the Touch ‘n Go eWallet. Once linked, the road charge (RC) will be automatically paid by the eWallet. Of course, you can still use Touch ‘n Go card to pay the RC if the balance is insufficient. Please note, you can reload (top up) the eWallet, but not the Touch ‘n Go card, through the app. On how to buy and use Touch ‘n Go, you may check this Touch ‘n Go card guide for Singapore drivers. How to collect Malaysia Vehicle Entry Permit (VEP)? You will receive an email notifying that your VEP RFID tag is ready. The subject of the email is something like “VEP RFID Tag Collection Invitation”. Do NOT wait for SMS! They do not send any text messages. Of course, you can also check the status in the VEP portal. Thank you for registering your Vehicle Entry Permit (VEP) online account. We would like you to present yourself at the VEP Tag Collection Centre in Malaysia to collect your VEP RFID Tag. Please note that all appointments must be made via the Tag Appointment menu in VEP Portal and we will not entertain any walk-ins during the tag collection. You must come to the VEP Tag Collection Centre with your registered vehicle to collect the VEP RFID Tag. This is an automated email. Please do not reply to this email. After receiving the email, you can check the available slots and book the appointment. Although the email list 4 possible locations, most of the time, only one location place is available. So, if you cannot find the slot in the desired location, you may have to choose other locations. We wish to confirm your appointment to collect your Vehicle Entry Permit (VEP) RFID tag. Please print this Tag Appointment Slip and bring along hardcopies of all the mandatory documents listed below. You must come to the collection centre with your registered vehicle to collect the VEP RFID Tag. You are also required to download and register for a Touch n’ Go e-wallet app on your mobile phone. Reminder: Your VEP and e-Wallet are linked to each other, and a mismatch in details between the both can result in failure to obtain your VEP RFID Tag. You are encouraged to arrive 15 minutes before your appointed time. If you do not come at the appointed time, you will have to reschedule your appointment. You should bring the documents as required. You also need to get a Touch ‘n Go card to pay the road charge. The collection point is NOT an office building. Some of them are container offices like below. During the collection, the RFID tag will be actually pasted on the windscreen. The location is somewhat awkward. It is on the top part of windscreen and close to the middle. But it should not affect the driver’s view, because 1). The tag is small; 2). The location is usually obstructed by the rear-view mirror already in most cars. The whole process will take about 30 mins to one hour. The officials need to test the tag with a handheld device. Of course, they will also check the car engine and chassis number. 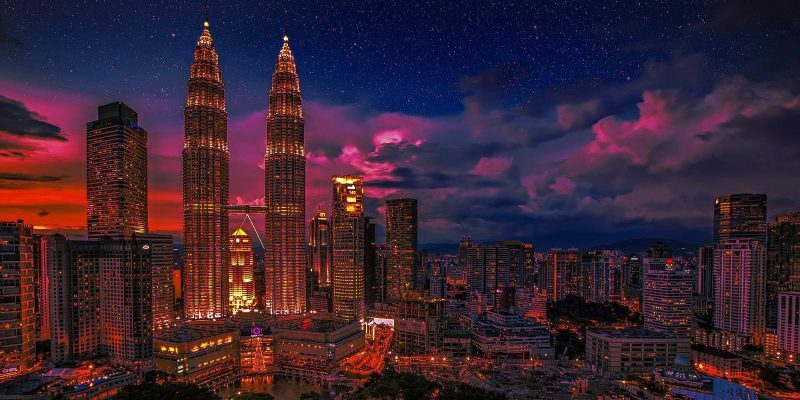 How to use Malaysia Vehicle Entry Permit (VEP)?. VEP is legally just a permit for your car entering Malaysia. 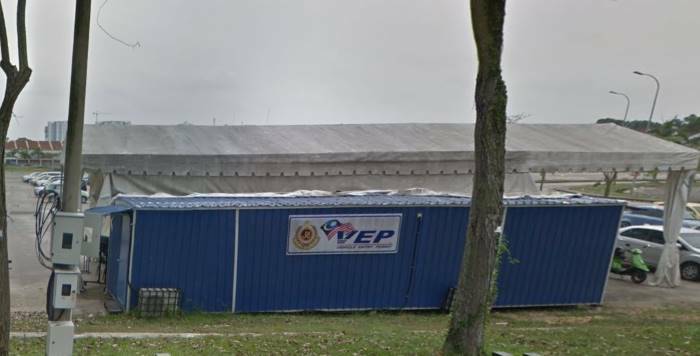 Currently, the VEP tag is only used in the two checkpoints: Sultan Iskandar Building (Bangunan Sultan Iskandar, BSI) via the causeway and the Sultan Abu Bakar Complex (Kompleks Sultan Abu Baka, KSAB) via the Second link. In the immigration counter, the tag will be recognized automatically. If the balance in your Touch ‘n Go eWallet is higher than RM20, the road charge (RC) will be deducted from the balance automatically, and you do not need to pay with the Touch ‘n Go card. 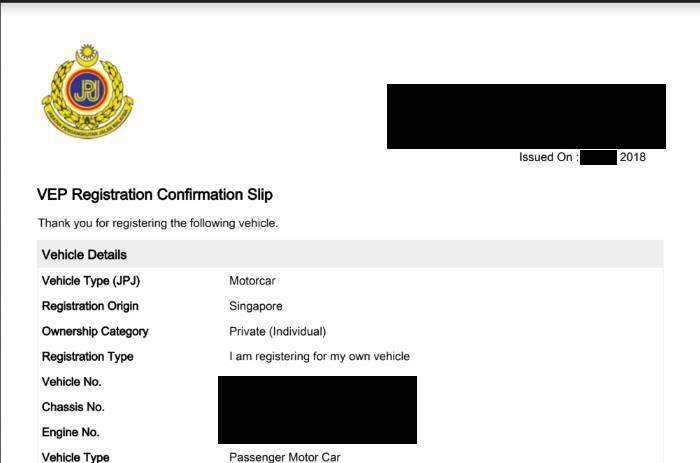 Singapore VEP is required for foreign-registered cars. Currently, the levy is S$35 per day for cars and $4 per day for motorcycles. 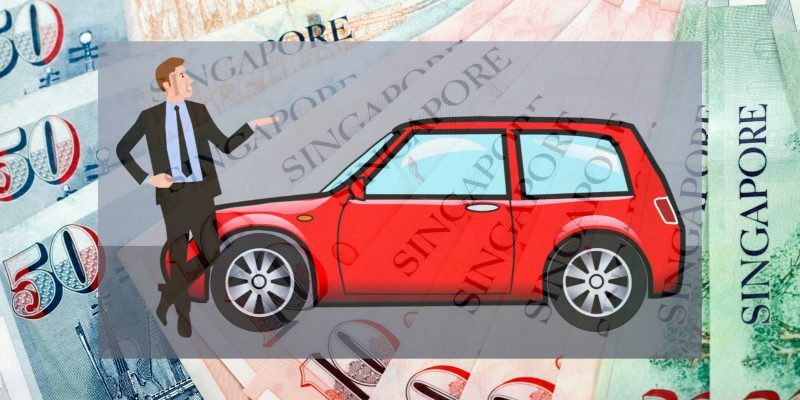 Without such a charge, some Singaporeans may try to register cars in Malaysia and mainly used in Singapore considering the high car price in Singapore. Anyway, Singapore cars do NOT need to pay Singapore VEP. 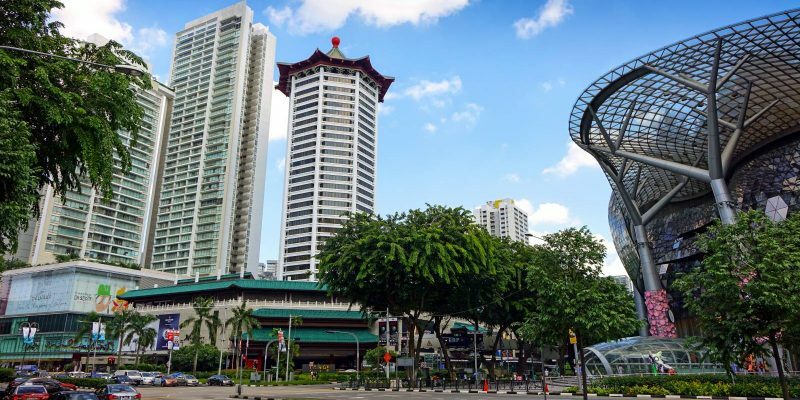 In fact, Singapore cars do NOT need to pay anything in Singapore side when entering Singapore. Do you know how to register, collect and use MalaysiaVehicle Entry Permit (VEP)? Have you got your VEP? Hi, i tried to register for collection appointment but it brings me to another system to key in username and password and it doesn’t seem like the same as the log in ID for the VEP portal. Do you know how to reset that? There should be the same account/login. Does the link direct you tot he VEP portal? The link in the email of “VEP RFID Tag Collection Invitation” can also be accessed inside the VEP portal. You can first log into the VEP portal (https://vep.jpj.gov.my/#). 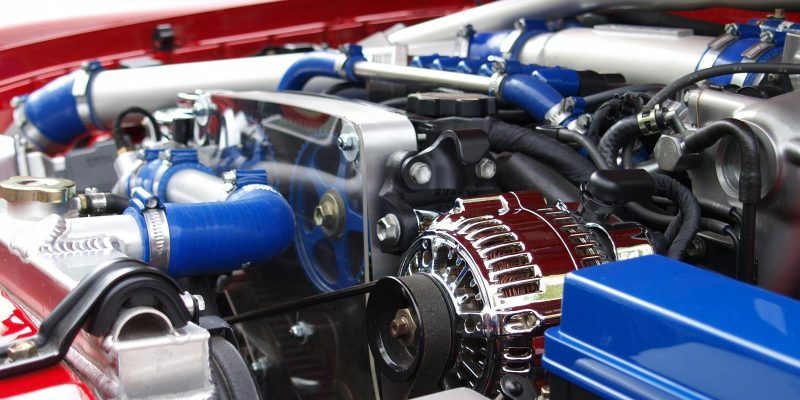 Under manage vehicles, you can find your registered car. To the right side of the entry, there should also be a link to make the appointment. Anyway, the link in the email should bring you to the VEP portal. You can always ignore the link and find the link inside the portal.